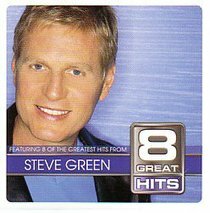 Steve Green is one of Christian music's most respected artists today. "I find that the best way to communicate is to sing songs that move me, first of all finding a lyric that resonates the truth, and then wrapping it in music that not only best conveys the message, but is also a delightful and pleasing expression." Performing live music is a cornerstone of Steve Green's career, a tradition he's maintained since 1984 when he established Steve Green Ministries. His music has been honoured with four Grammy nominations, 13 No. 1 songs and six Dove Awards, Christian music's highest honour. With 24 recordings to his credit, including children's projects and Spanish-language albums, Green has sold over three million albums worldwide. Before performing solo, Green contributed his vocal talents to well-known groups Truth, White Heart and the New Gaither Vocal Band. Steve has been involved in high-profile occasions like Promise Keepers and Billy Graham Crusade events. Green has worked to raise believers' awareness of persecuted Christians around the world and has performed worldwide in 44 countries, including various Spanish-speaking countries, as well as South Africa, Korea and the Philippines. - Sparrowrecords.